Jones: "I Aim To Drag Dubois Up The Hill!" Former soldier DL Jones is promising to dispense a solid square bashing to Heavyweight hotshot Daniel Dubois when the undefeated 17 stone juggernauts collide for the Southern Area strap at London’s York Hall on February 24th. ‘My biggest attributes are definitely my fitness and my mental strength; both products of the army,’ says the 6ft 5in tower from Queenborough, Kent who is unbeaten in nine (one draw). Twenty year old ‘Dynamite Dubois’ has blitzed all six pro opponents inside five minutes en route to the title, forcing a trail of prospective opponents to hide behind the sofa. Soldier Jones, however, was more than willing to step up to the frontline. ‘Daniel is avoided because he hits like a steam train,’ concedes the 36 year old father of two who is coached by Ray Askew and Sam Latham at the Invicta gym in Kent. ‘He’s a very good lad, a nice tidy boxer with a thunderous rear hand. He’s destined to go all the way and everybody expects him to just blast through me. He’s going to charge at me and try to wipe me out, just like he’s wiped everybody else out. DL (real name Dave) points out that he has been active in combat sports for almost a quarter of a century, longer than ‘Triple D’ has been alive. ‘I did kickboxing for a couple of years from the age of about 12 but, though I was always big, I was never a rough kid really, and didn’t start amateur boxing at the Sheerness ABC until I was about 18,’ he says. ‘My career really took off when I joined the army at 22. I became a ‘tracksuit soldier’ for two years. The facilities were amazing and we were coached by (six time ABA champion and Commonwealth Games gold medallist) Chris Bessey MBE. ‘I suppose I had about 20 contests and won most of them. I was Army champion, fought in the Combined Services and got to the semis of the National Novices. ‘My last amateur fight was my first without a headguard and I got stopped by Nick Webb (now 12-0 as a pro) on a cut in the second round. Basically, the doc sh** himself! After that, I packed in for three or four years. In addition, the ex squaddie is 16 years senior to Dubois, claims three more pro fights and, with all bouts going to the cards, has boxed 35 more rounds since ditching his singlet in September 2014. While the Londoner is yet to hear the bell for round three as he enters this 10 rounder, Jones has travelled the six round trip on three occasions and also completed an eight rounder. ‘That gives me optimism,’ says the 6ft 5in Jones who now earns his crust as a full-time bricklayer. ‘I get up at 5.30 for my runs – hill reps and intervals – before work, then train for a couple of hours in the evening so it’s difficult but I enjoy it. ‘The York Hall is a brilliant, historic venue. There’s a terrific atmosphere with all the fans right on top of the ring. I’ve got nothing to lose and guarantee I’ll do the best I can. I’m certainly not coming to lie down. An upset could change everything for me. ‘Dubois’ physique certainly doesn’t scare me. I’ve beaten plenty his frame before. It’s his ability not his size that I need to worry about. Elsewhere on a stacked card Nantwich Heavyweight star Nathan Gorman fights over eight rounds; Welling Super-Featherweight Archie Sharp aims to improve his unbeaten record to 12-0; former Southern Area Super-Featherweight Champion Boy Jones Jnr fights at Lightweight for the first time; gifted Southampton Featherweight Ryan ‘The Piranha’ Garner looks to get his career back on track when he fights over four rounds; Ilford Welterweight talent Hamzah Sheeraz fights in his second professional contest and stylish Ilford Super-Middleweight Umar Sadiq and former Team GB Flyweight Harvey Horn both look to go 2-0. Limited remaining tickets for Saturday 24th February are available to purchase from www.ticketmaster.com and directly from fighters on the bill. Media accreditation: Media and photographers wishing to attend the show can apply via the event page on the Frank Warren website: https://www.frankwarren.com/allevents/yarde-v-averlant/. The deadline for applications is 5.00pm on Friday 16th February. Promoter Frank Warren returns to the World-famous York Hall on Saturday 24th February for an action-packed evening of boxing featuring some of the very best up-and-coming prospects in the UK, broadcast live on BT Sport and BoxNation. Warren’s opening show of 2018 will star an array of young talent including Ilford Light-Heavyweight powerhouse Anthony ‘The Beast’ Yarde, Greenwich Heavyweight sensation Daniel ‘Dynamite’ Dubois and Manchester’s undefeated English Super-Featherweight Champion Zelfa ‘Brown Flash’ Barrett. Yarde (14-0, 13 KO’s) defends his WBO Intercontinental and European Light-Heavyweight titles against Frenchman Tony Averlant (26-9-2, 5 KO’s). A fruitful 2017 that saw Yarde pick up the Southern Area and WBO Intercontinental and European titles cemented his place as one of the hottest properties in British boxing. “2017 was a good year for me,” said Yarde. “I picked up three belts and stopped all five of my opponents. This year is going to be bigger and better. My job is to keep my head down, work hard and enjoy the journey. Knockout artist Dubois (6-0, 6 KO’s) fights at the historical East London venue for the first time in his professional career as he defends his Southern Area Heavyweight belt against Queensborough’s DL Jones (8-0-1). 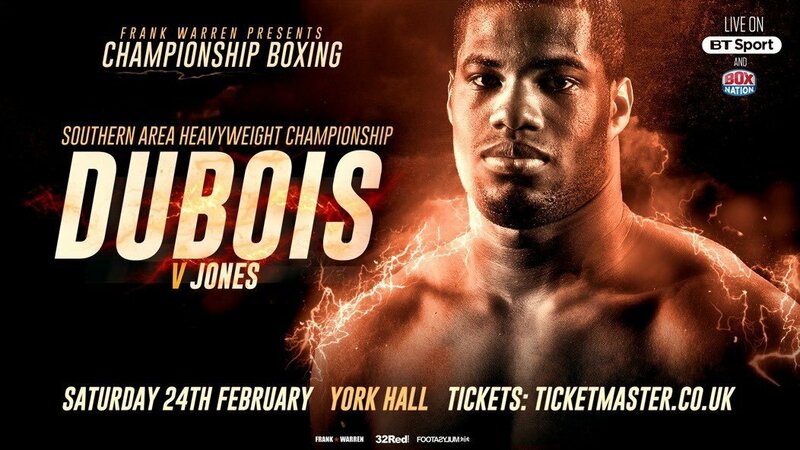 Dubois is promising to start the New Year with another explosive performance at the iconic fight theatre that has hosted a number of current and former British Heavyweight World Champions including Lennox Lewis, David Haye and Anthony Joshua. Already a Southern Area and WBC World Youth Champion, the young giant is aiming to add more belts to his growing collection before his 21st birthday in September. “I want every belt,” said Dubois. “I won two belts in my first year as a professional boxer and I’ll be looking to win more in 2018. I’m ready to start the year with a bang. Barrett (19-0, 12 KO’s) takes on former British Super-Featherweight title challenger Ronnie Clark (20-4-2, 10 KO’s) when he fights in the capital for the first time. ‘Brown Flash’ hopes his English title win against fellow Mancuanian Chris Conwell at the First Direct Arena in October will be the first of many belts. The nephew of former British and European Super-Lightweight Champion Pat ‘Black Flash’ Barrett is already creating waves in the North West and is determined to justify the hype against Dundee’s Clark. A product of the renowned Collyhurst and Moston boxing club, many pundits believe Barrett is a World Champion in waiting; and the man himself is aiming to prove them right by the age of 27. “By the time I’m 27 I’ll be a World Champion,” said Barrett. “Becoming a World Champion is my main ambition and I have the right team around me to achieve that dream. I’m incredibly hungry and I’ll be looking to challenge for more belts this year. Elsewhere on a stacked card hard-hitting Southampton Super-Welterweight Joe Pigford returns to the ring after a brutal KO win over Aaron Morgan in May 2017; all-action Welling Super-Featherweight talent Archie ‘Sharpshooter’ Sharp aims to improve his unbeaten record to 12-0; former Southern Area Super-Featherweight Champion Boy Jones Jnr fights a Lightweight for the first time; gifted Southampton Featherweight Ryan ‘The Piranha’ Garner looks to get his career back on track when he fights over four rounds; Ilford Welterweight talent Hamzah Sheeraz fights in his second professional contest; stylish Ilford Super-Middleweight Umar Sadiq and former Team GB Flyweight Harvey Horn both look to go 2-0 while Beckton Lightweight and Anthony Yarde gym mate Mohammed Bilal Ali makes his professional debut.